Stem cells can develop into many different cell types and allow our bodies to heal, such as when making new bone after a fracture. The immediate environment around them is highly specialised, it conveys both mechanical and chemical signals to the stem cells, and this has a big effect on their activity. They ‘decide’ what to do, what to become, depending on the interactions with this surrounding environment, which is termed the stem cell niche. Our group in the Glasgow CeMi studies how stem cells interact with these niche environments and how this knowledge can be applied for regenerative medicine and therapeutic discoveries. PhD student Ms Hannah Donnelly and Professors Matt Dalby and Manuel Salmeron-Sanchez have just published a review article in the Journal of the Royal Society Interface, where they discuss new in vitro culture systems and biomaterial strategies that are able to seize particular features of stem cell niches. These strategies are being used to engineer more physiological-like models, that are more accurate than current more simplified technologies that do not recreate the tissue complexity seen in the body. For instance, with some of these new models more accurate predictions about the success of new molecules can be made in drug discovery, before reaching animal or human testing stages. 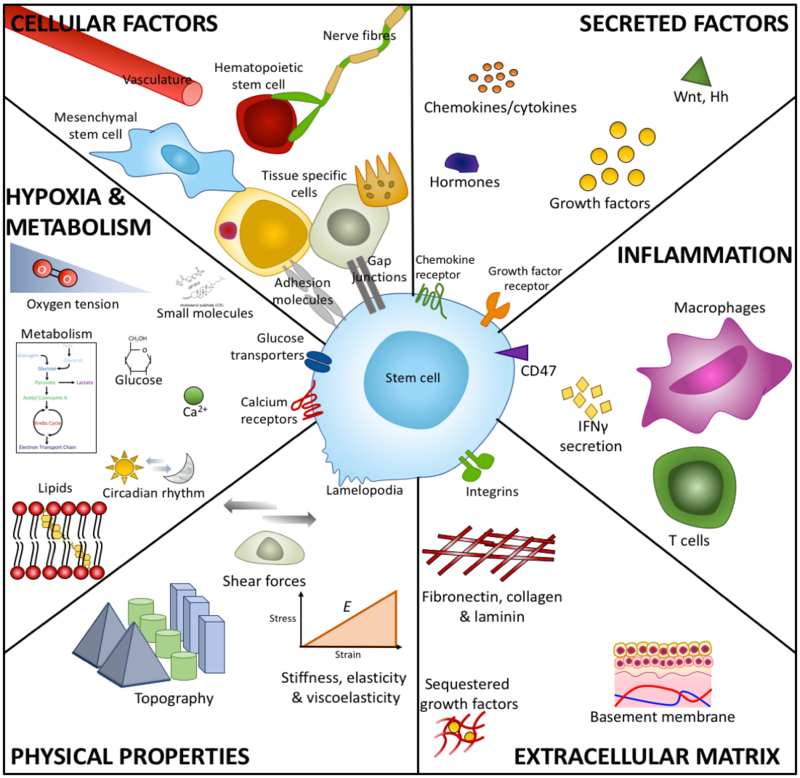 The review explores models and strategies for stem cell differentiation and self-renewal that use surface topography, mechanical properties from the macro to the micro/nano scale, cells adhesion controlled through a variety of surface chemical ligands, and how the complex interrelation between all these parameters can be harnessed for use in regenerative medicine.